This newsletter was sent June 28, 2016. If you’d like to receive our next bi-weekly digest full of a curated collection of resources, workshops, policy highlights, and action items that affect children and youth with special health care needs, please sign up here. 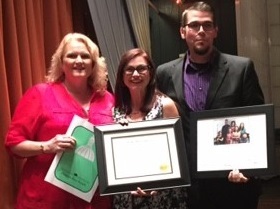 FVCA Project Leadership graduate Alisa Rosillo was given the Roz Wofsy Advocacy Award earlier this month by the Developmental Disabilities Council Of Contra Costa County in honor of her work on AB 662. She also received a certificate of recognition from the California State Assembly in commemoration of her selection as a Roz Wofsy recipient. Signed into law on October 10, 2015, AB 662 requires that all “commercial places of public amusement” built after January 1, 2020 include and maintain at least one adult changing station for people with disabilities. Businesses that are renovated after January 1, 2025 must also upgrade their grounds to include an adult changing station. Both Alisa’s children, Max, 15, and Leo, 17, require diaper changes and exceed the size and weight limit of a typical child’s changing table. Inspired by the wish to include her teenagers in regular outings all kids love, Alisa used the skills learned through the Project Leadership course to hone her voice and build her advocacy platform. Conversations and meetings with her local Assemblymember, Susan Bonilla, then led to the formation and passage of AB 662. No stranger to the world of policy, Alisa worked with then-Assemblymember, now Congressman, Mark DeSaulnier to pass AB 1531 in 2007. This bill raises the fine for those abusing disabled parking spots and ensures these spaces and aisles are visibly painted blue and white. Alisa’s advocacy also extends to education—she’s been working within the Contra Costa School District to create K-12 classrooms that allow students who use speech generating devices to access curriculum. Her eldest son, Leo, will be aging out of the school system this year, so she’ll be looking at how these classroom models can continue in a bridge type program over the next four years. On the changing table front, Alisa now hopes to take the topic to the national level with the backing of Congressman DeSaulnier. “Since bathroom issues are in the national spotlight, the timing is right and the fire is hot,” she says. “We have the momentum to take this to the next level.” For a look at Alisa’s past advocacy work, click here. A new report from the Anne E. Casey Foundation and Children Now, Kids Count: State Trends In Child Well-Being, ranks California’s overall child well-being at #36 (with #1 being the best). 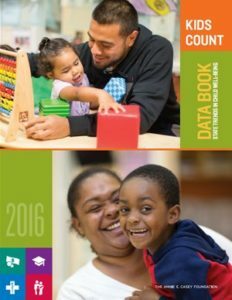 The data examines four sub-sections: economic well-being (#47), family and community (#41), education (#35), and health (#11). The report found there have been fewer child deaths and teen pregnancies, a rise in the number of insured kids, and more high schoolers graduating on time. However, Generation Z children face “the weakest economic prospect in three generations,” stagnant wages, and high college costs. 23% of children live in poverty and 33% of parents lack stable employment—both figures have increased since last year. To read an article pulling further key points from the report (and the report itself), click here. The Interagency Autism Coordinating Committee is looking for input from people with autism, family members, service providers, and advocates as they prepare to revise their strategic plan and update government priorities on autism research, services, and policy for the first time in ten years. The committee addresses seven topics: screening and diagnosis, the underlying biology of autism, risk factors, treatments and interventions, services, lifespan issues/surveillance, and infrastructure—comments should be related to one or more of these topics. To provide feedback, click here for a survey. California State University, East Bay is conducting a survey on the parent experience of advocating for children with special needs. The results will be used to inform the services and polices that serve this population. Survey participants will be entered in a drawing to win a $50 Amazon gift card. For more information and a link to the survey, click here (Spanish instructions here). The National Center On Birth Defects And Developmental Disabilities recently translated key sickle cell fact sheets into Spanish and French. To access the new materials, click here. Topics include getting screened, supporting students with sickle cell disease, tips for preventing infection, and more. The American Journal of Preventive Medicine has also released a new supplement that covers the state of sickle cell related care in the United States. To read the supplement, click here. 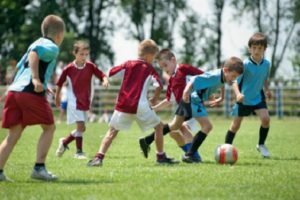 This publication from The National Hemophilia Foundation provides information to help children and teens with bleeding disorders safely participate in physical activity. It offers a list of illustrated stretches, safety ratings for many types of sports and activities, recommended strength training excercises, and more. To read the publication, click here. A new white paper from the Health And Wellness Alliance For Children describes how care coordination played a key role in reducing pediatric asthma emergency room visits by 49% in Dallas, Texas. Three facets helped tie together care coordination: a standardized Asthma Action Plan, the mobile asthma-management app My Asthma Pal, and a community ambassador pilot program. To learn more about how these facets worked together and to read the white paper, click here (you can also create your own Asthma Action Plan and download the mobile app). The Eunice Kennedy Shriver Center worked with an advisory committee of parents of children with special needs to create a curriculum that increases preparedness knowledge and allows for successful planning. The curriculum includes a toolkit, tip sheets, and a template for a personal emergency plan. There’s also resources on how to share information about your child’s unique needs with first responders. To access the curriculum, click here.